A reference to an overloaded function set, either an UnresolvedLookupExpr or an UnresolvedMemberExpr. Definition at line 2734 of file ExprCXX.h. Definition at line 2824 of file ExprCXX.h. Definition at line 368 of file ExprCXX.cpp. 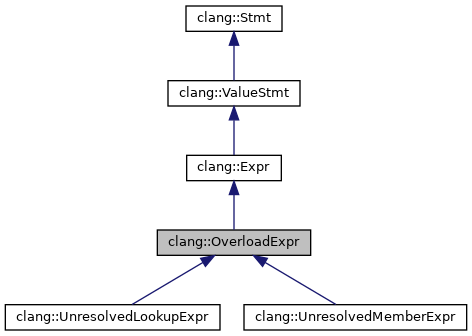 References Begin, End, clang::Stmt::ExprBits, clang::SourceLocation::isValid(), and clang::Stmt::OverloadExprBits. Definition at line 437 of file ExprCXX.cpp. References clang::NestedNameSpecifier::containsUnexpandedParameterPack(), clang::DeclarationNameInfo::containsUnexpandedParameterPack(), clang::Stmt::DependentScopeDeclRefExprBits, clang::Expr::Expr(), clang::Stmt::ExprBits, clang::NestedNameSpecifierLoc::getNestedNameSpecifier(), clang::NestedNameSpecifier::isInstantiationDependent(), clang::DeclarationNameInfo::isInstantiationDependent(), clang::SourceLocation::isValid(), clang::OK_Ordinary, clang::Stmt::OverloadExprBits, and clang::VK_LValue. Definition at line 2910 of file ExprCXX.h. Copies the template arguments into the given structure. Definition at line 2905 of file ExprCXX.h. Referenced by clang::Sema::AddOverloadedCallCandidates(), BuildRecoveryCallExpr(), ResolveOverloadForDeduction(), and clang::Sema::ResolveSingleFunctionTemplateSpecialization(). Definition at line 2832 of file ExprCXX.h. Referenced by clang::TreeTransform< Derived >::TransformOverloadExprDecls(), clang::ASTNodeImporter::VisitUnresolvedLookupExpr(), and clang::ASTNodeImporter::VisitUnresolvedMemberExpr(). Definition at line 2826 of file ExprCXX.h. Referenced by clang::Sema::AddOverloadedCallCandidates(), buildOperatorCoawaitCall(), clang::Sema::buildOverloadedCallSet(), isParenthesizedADLCallee(), clang::Sema::resolveAddressOfOnlyViableOverloadCandidate(), ResolveOverloadForDeduction(), clang::Sema::ResolveSingleFunctionTemplateSpecialization(), clang::Sema::tryExprAsCall(), and clang::TextNodeDumper::VisitUnresolvedLookupExpr(). Definition at line 2829 of file ExprCXX.h. Referenced by clang::Sema::AddOverloadedCallCandidates(), buildOperatorCoawaitCall(), clang::Sema::buildOverloadedCallSet(), clang::Sema::resolveAddressOfOnlyViableOverloadCandidate(), ResolveOverloadForDeduction(), clang::Sema::ResolveSingleFunctionTemplateSpecialization(), clang::Sema::tryExprAsCall(), and clang::TextNodeDumper::VisitUnresolvedLookupExpr(). Definition at line 2794 of file ExprCXX.h. References clang::Expr::getType(), clang::Expr::IgnoreParens(), clang::Type::isSpecificBuiltinType(), and clang::Result. Referenced by clang::Sema::CheckAddressOfMemberAccess(), DiagnoseReinterpretUpDownCast(), clang::Sema::resolveAddressOfOnlyViableOverloadCandidate(), ResolveOverloadForDeduction(), TryAddressSpaceCast(), and clang::Sema::tryExprAsCall(). Definition at line 2867 of file ExprCXX.h. Referenced by clang::TreeTransform< Derived >::TransformOverloadExprDecls(), and clang::ASTNodeImporter::VisitUnresolvedLookupExpr(). Definition at line 2843 of file ExprCXX.h. Referenced by clang::Sema::AddOverloadedCallCandidates(), BuildRecoveryCallExpr(), DecodeOperatorCall(), DiagnoseReinterpretUpDownCast(), FinishOverloadedCallExpr(), isParenthesizedADLCallee(), clang::TreeTransform< Derived >::TransformOverloadExprDecls(), TryAddressSpaceCast(), clang::TextNodeDumper::VisitUnresolvedLookupExpr(), clang::ASTNodeImporter::VisitUnresolvedLookupExpr(), and clang::ASTNodeImporter::VisitUnresolvedMemberExpr(). Gets the full name info. Definition at line 2840 of file ExprCXX.h. Referenced by clang::ASTNodeImporter::VisitUnresolvedLookupExpr(), and clang::ASTNodeImporter::VisitUnresolvedMemberExpr(). Definition at line 2846 of file ExprCXX.h. Referenced by BuildRecoveryCallExpr(), FinishOverloadedCallExpr(), ResolveOverloadForDeduction(), clang::Sema::ResolveSingleFunctionTemplateSpecialization(), clang::TreeTransform< Derived >::TransformOverloadExprDecls(), clang::ASTNodeImporter::VisitUnresolvedLookupExpr(), and clang::ASTNodeImporter::VisitUnresolvedMemberExpr(). Definition at line 3838 of file ExprCXX.h. Definition at line 2820 of file ExprCXX.h. Gets the number of declarations in the unresolved set. Definition at line 2837 of file ExprCXX.h. Definition at line 2893 of file ExprCXX.h. Referenced by DecodeOperatorCall(), isParenthesizedADLCallee(), and clang::TreeTransform< Derived >::TransformOverloadExprDecls(). Fetches the nested-name qualifier, if one was given. Definition at line 2849 of file ExprCXX.h. Referenced by clang::Sema::buildOverloadedCallSet(), DecodeOperatorCall(), isImplicitThis(), and isParenthesizedADLCallee(). Fetches the nested-name qualifier with source-location information, if one was given. Definition at line 2855 of file ExprCXX.h. Referenced by BuildRecoveryCallExpr(), DiagnoseReinterpretUpDownCast(), clang::TreeTransform< Derived >::TransformOverloadExprDecls(), TryAddressSpaceCast(), clang::ASTNodeImporter::VisitUnresolvedLookupExpr(), and clang::ASTNodeImporter::VisitUnresolvedMemberExpr(). Definition at line 2875 of file ExprCXX.h. Definition at line 2887 of file ExprCXX.h. Definition at line 2859 of file ExprCXX.h. Referenced by BuildRecoveryCallExpr(), clang::TreeTransform< Derived >::TransformOverloadExprDecls(), clang::ASTNodeImporter::VisitUnresolvedLookupExpr(), and clang::ASTNodeImporter::VisitUnresolvedMemberExpr(). Return the optional template keyword and arguments info. Definition at line 3821 of file ExprCXX.h. Definition at line 2766 of file ExprCXX.h. Return the results. Defined after UnresolvedMemberExpr. Definition at line 3815 of file ExprCXX.h. Definition at line 2759 of file ExprCXX.h. Return the optional template arguments. Definition at line 3831 of file ExprCXX.h. Definition at line 2774 of file ExprCXX.h. Determines whether this expression had explicit template arguments. Definition at line 2885 of file ExprCXX.h. Referenced by clang::Sema::AddOverloadedCallCandidates(), BuildRecoveryCallExpr(), DecodeOperatorCall(), isImplicitThis(), ResolveOverloadForDeduction(), clang::Sema::ResolveSingleFunctionTemplateSpecialization(), clang::TreeTransform< Derived >::TransformOverloadExprDecls(), clang::ASTNodeImporter::VisitUnresolvedLookupExpr(), and clang::ASTNodeImporter::VisitUnresolvedMemberExpr(). Determines whether the name was preceded by the template keyword. Definition at line 2882 of file ExprCXX.h. Definition at line 2778 of file ExprCXX.h. Definition at line 2900 of file ExprCXX.h. Referenced by isImplicitThis(), clang::ASTNodeImporter::VisitUnresolvedLookupExpr(), and clang::ASTNodeImporter::VisitUnresolvedMemberExpr(). Definition at line 2735 of file ExprCXX.h. Definition at line 2736 of file ExprCXX.h.